We will relax in this larger room with partial lake and garden views and large double-aspect windows. The room features one king-sized bed and a separate seating area. We will soak in the views on our beautiful balcony. 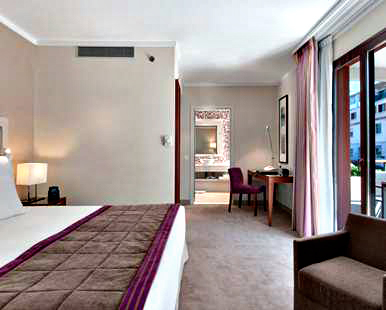 We will enjoy our stay in this bright, south facing room with one king-sized bed and large double-aspect windows. We will refresh in the marble bathroom and wrap up in the fluffy bathrobes. 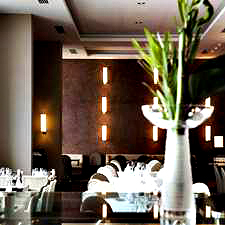 The Cannelle Restaurant seats 92 customers plus an outside terrace during the summer months. Offering us a delicious world cuisine, Cannelle is open for breakfast throughout the year and for dinner during the summer season, with stunning lake views in winter and summer. 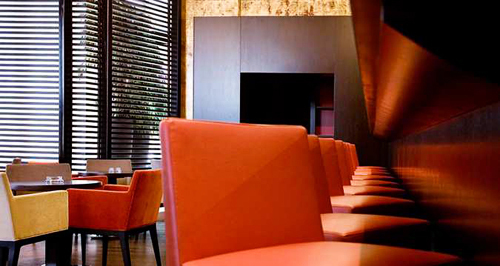 The Cosmopolitan Bar features three different areas combining simplicity in design with informal atmosphere. We will stop by for a pleasant drink and appetizers. 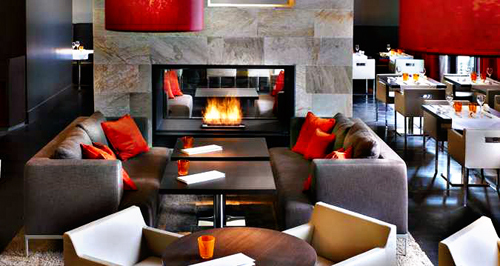 Riva Restaurant, Bar and Loune is a traditional French Brasserie located on the street and Garden Level of the hotel with direct access to the fashionable center of Evian. This charming sidewalk cafe will allow us to enjoy a resort lifestyle. 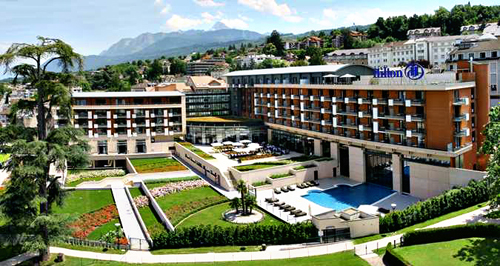 Nestled between Lake Geneva and the French Alps, the Hilton Evian-les-Bains hotel offers breathtaking views. 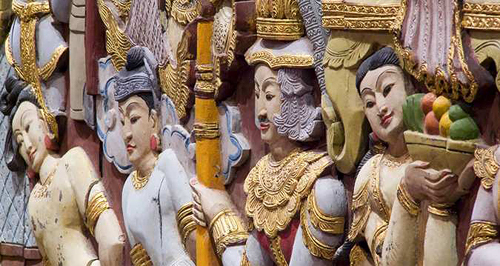 Located in the heart of the city, the hotel is within walking distance to shops, restaurants, and attractions. 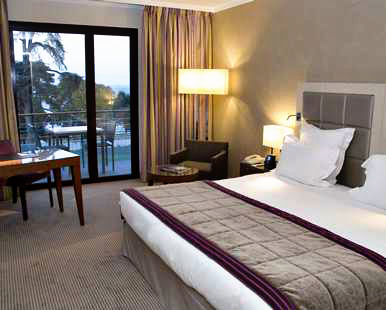 We will absorb city or lake views from a deluxe room, and relax with innovative cuisine in a stylish restaurant. 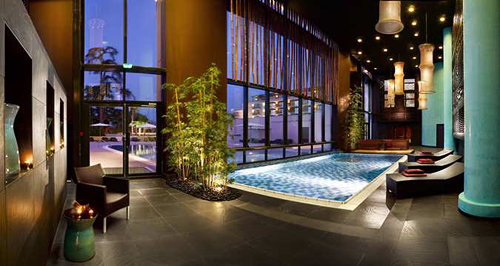 We will plunge into the swimming pool, enjoy a workout at the fitness center, and indulge in a massage at the spa. 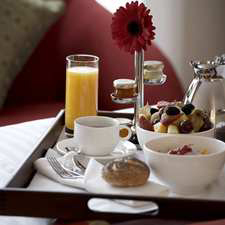 With special rates and breakfasts for two - from healthy to decadent - the Bed & Breakfast packages are the perfect way for us to relax and recharge. We will allow the expert therapist to draw on their vast expertise to create a special massage for us in this haven of peace. This package includes Buffet breakfast in the Cannelle restaurant, a 20 min Intuitif Treatment per person, and free access to the relaxing indoor pool, outside swimming pool, sauna, hammam & fitness center. This wonderful package will leave us feeling pampered with our choice of luxurious accommodations, a bottle of champagne, macaroons and roses petals in the bedroom, a buffet breakfast in Cannelle Restaurant, half board in one of the restaurants, and free access to the indoor relaxing pool, outdoor swimming pool, sauna, hammam, and fitness center. 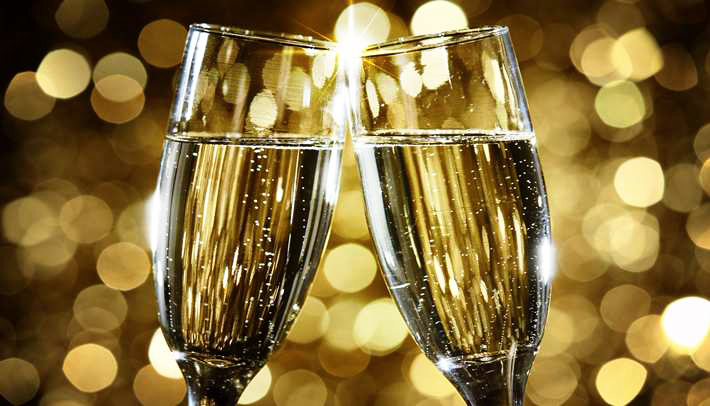 Together we will enjoy our choice of luxurious accommodations, buffet breakfast in the Cannelle restaurant an 80 minute treatment per person, and free access to the relaxing indoor pool, outside swimming pool, sauna, and hammam & fitness center. 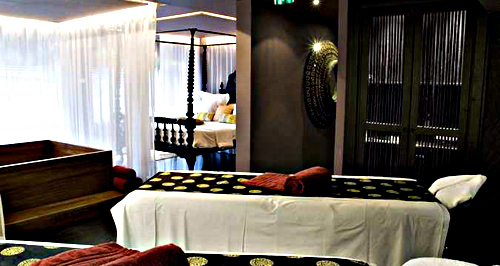 We will allow the expert therapist to draw on their vast expertize to create a special massage - just for VIP. It will include our choice of luxurious accommodations, a buffet breakfast in the Cannelle restaurant, and VIP room in the SPA for 3 hours, and free access to the relaxing indoor pool, outside swimming pool, sauna, and hammam & fitness center. 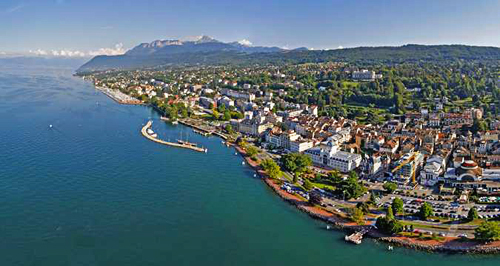 We will explore Evian-les-Bains and enjoy a spa treatment at the hotel in the Buddha-Bar spa. We will get our choice of luxurious accommodations, buffet breakfast in the Cannelle restaurant, one intuitive Spa treatment of 50 minutes per person and free access to the inside relaxing pool, outside swimming pool, sauna, hammam & fitness center during all the stay. 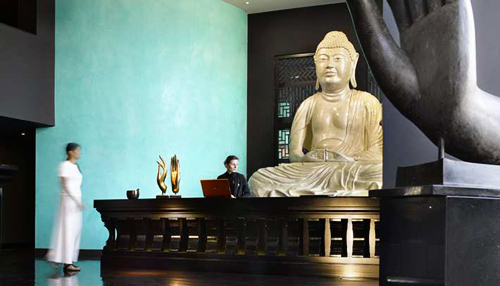 Modelled after Buddha-Bar Paris, Buddha-Bar Spa features an interior designed to arouse the senses and induce a state of relaxation and wellbeing. With its B/Attitude® skin care products, Buddha-Bar Spa's mission is our wellness, achieved through the harmonization of mind and body. Barattitude offers us fruit juices, mocktails and a wide selection of teas and coffees. We will unwind and mingle with other guests before, after, or in between spa treatments and select from a variety of healthy drinks for the body and mind. 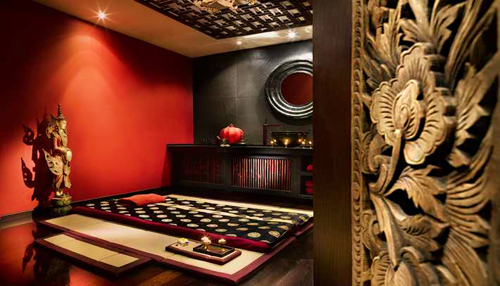 Buddha-Bar Spa also features a boutique offering B/Attitude&Reg; products along with signature items to recreate the spa atmosphere at home. We will enjoy the B/Attitude experience in a VIP Suite, with 2 massage tables, a private Japanese bath, private shower, and lounge area for a moment of utter relaxation, while we are lulled by the comforting surroundings that include your own private fireplace.